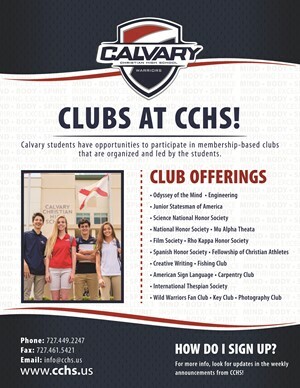 Calvary students have opportunities to participate in membership-based clubs that are organized and led by students with a CCHS employee serving as the Club Sponsor. Some of the clubs have membership requirements that must be met, and other clubs have open membership to CCHS students. The ASL Honor Society encourages and recognizes high academic achievement in ASL studies. We work to develop relationships to bring others to dynamic life in Christ through service in the deaf community. The ASL Honor Society sponsor is Mrs. Janessa Jannarone. The Calvary Carpentry Club is designed to help teach students a practical skill and trade. There is also an element of entrepreneurship that we will highlight as we design and sell our custom farm tables. The last reason to join the club is because the proceeds we make will help send students on mission trips throughout the year. We seek to build character while building tables. The club sponsor is Pastor Justin Facenda, jfacenda@calvary.us. Creative Writing Club is a place for students to challenge their imaginations in a constructive and interactive environment. Students will write original works and both give feedback to and receive feedback from peers. The club sponsors are Mrs. Jessie Weaver and Mrs. Natalie Wall. The goal of the CCHS Engineering Club is to teach students engineering concepts in a fun way that will broaden their knowledge of engineering and allow them to interact with other students who have a shared interest in engineering. The Engineering Club allows students to explore a variety of engineering fields and exposes students to the many different careers available in the fields of engineering through the use of guest speakers. The Club expands students’ leadership skills by conducting demonstrations, lab activities, and community outreach events. The Engineering Club reinforces the importance of other related classes, such as math and chemistry. The club sponsor is Mrs. Katie Chappell. Calvary Christian High School has a local chapter of the Fellowship of Christian Athletes. Students may join FCA by attending the monthly meetings held for Bible study and fellowship. FCA challenges athletes to use the powerful medium of athletics to impact the world for Jesus Christ. FCA is the largest Christian sports organization in America. FCA focuses on equipping, empowering, and encouraging students to make a difference for Christ. The club sponsor is Coach Darrell Don. Do you enjoy movies, popcorn, and hanging out with friends? Consider joining the Film Society. We host films throughout the year, typically on Friday evenings from 6:30-9:30 P.M. The viewing of each film is followed by a brief discussion about the artistic and entertaining elements of the films as well as the worldviews they portray. Movie choices change from year to year, representing different genres, both classic and contemporary. Popcorn, drinks, and light refreshments are provided. A signed permission form is required to participate. The club sponsors are Mr. Ron Perkins and Ms. Taylor Fry. Select this link to download the permission form. The purpose of the Calvary Christian High School Fishing Club is to engage in the art and sport of fishing and to build lifelong relationships in the model of Christ and his Disciples. Members of the Fishing Club will not only learn and practice new fishing skills, they will also serve the community by learning to be good stewards of the marine environment through learning sustainable recreational fishing practices and participating in events like beach cleanups and habitat restoration. Club fishing opportunities will extend throughout the year. The club sponsor is Mr. Paul Matthews. The International Thespian Society (ITS) is the honor society for secondary school theatre students. Membership is granted for the performance of meritorious work in theatre arts. High school Thespian induction eligibility requirements and procedures are detailed in the Junior Thespian Troupe Handbook. The club sponsor is Mrs. Anne Marie Gaige. Junior State of America (JSA) is the largest student-run organization in the country, with chapters in 35 states and engaging more than 11,000 students, aimed at strengthening American democracy by preparing high school students for responsible leadership. JSA Calvary Chapter hosts debates, seminars, "thought talks", and political awareness events throughout the year. JSA is especially focused on student leadership development and provides opportunities to connect with students at conferences and summer programs. Students interested in current events, debate, or politics are encouraged to get involved. JSA - Be The People. The club sponsor is Mr. Ron Perkins. The Key Club is an international student-led organization which provides its members with opportunities to provide services, build character and develop leadership. The club sponsors are Ms. Jordan Sweetser and assisted by Ms. Diana Kirtland. Calvary Christian High School has a local chapter of the Math Honor Society called Mu Alpha Theta. The main purpose of Mu Alpha Theta is to stimulate a deeper interest in mathematics and an appreciation of its Creator. Students meeting the eligibility requirements may apply for membership into the organization. The formal induction ceremony is held in the spring. Students must be in grades 10 – 12. Students must have successfully completed at least 2 of the following courses: Algebra I, Geometry, and Algebra II. Students must have a minimum of a 3.0 GPA in mathematics. The Mu Alpha Theta sponsor is Ms. Stephanie Brundage. Select this link to pay the annual membership dues. The National Honor Society is a by-invitation organization open to rising juniors and seniors. The NHS recognizes students who display outstanding accomplishments in scholarship, leadership, service, and character throughout the school and their community. All applicants must maintain an unweighted GPA of at least 3.25 and have 25 hours of community service per year of high school logged at the time of application. The Odyssey of the Mind team will compete against other high schools in an academic competition that combines long-term creativity and innovation with rapid-fire brain-crunching challenges. The regional competition is in February with the state competition in April. We meet once a week immediately after school in the computer lab. The purpose of the Photography Club is for students to build on the creative aspects and techniques of photography. We will do this through discussion, field assignments and post editing. Throughout the club we will focus on different areas of photography so the student can broaden their skill set and develop new interests. Students eligible for membership must be a junior or senior and have demonstrated excellent academic performance in Social Studies. Students must provide community service toward the school or community and exhibit the attributes of leadership and good citizenship. Students must maintain a 3.5 unweighted GPA in their social studies classes and must have (or be able to earn) at least four credits in Social Studies upon graduation. The mission of the CCHS SNHS is to encourage participation in and recognition of scientific and intellectual thought through a Biblical worldview. Our goal is to advance the students’ knowledge, to communicate with the scientific community, and to aid the civic community with its comprehension of science. Students are encouraged to participate in community service and, in turn, encourage a dedication to the pursuit of scientific knowledge that benefits all mankind. The mission of the National Spanish Honor Society is to recognize high achievement in Spanish by students of secondary schools and to promote continuity of interest in Hispanic studies. Calvary Christian High School established our chapter, Calvario, in 2014. In addition to promoting an appreciation for Spanish language and culture, the SHS is also responsible for the Spanish Peer Tutoring Program at Calvary. The Wild Warriors are a group of enthusiastic students who promote school unity, exhibit good sportsmanship and show their Warrior spirit in support of the school’s athletic teams. Select the image to download the clubs flyer.